A powerful and exciting movie that does feel a little slow or long at times, but definitely delivers with both the action and emotion. American Sniper is a cross between action and drama as it tackles the psychological mindset of a guy who has killed more people than just about anyone in the war. Bradley Cooper plays Chris Kyle, a guy who is so good at his job that he has been given the nickname “Legend,” by the men who are forever grateful to him for saving their lives. The movie takes us through four different tours with Kyle coming back to the U.S. for a scene or two in between each one to spend time with his wife. It’s the tour scenes that really make up the bulk of the movie. Most things work about this film, including the way each tour focusses on a specific target and either getting that target or being attacked by him. Still there are other things that would have certainly made it better, such as more characters being developed and given some attention, besides Kyle. 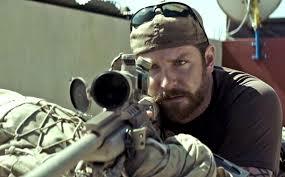 American Sniper is a movie loaded up with gritty intensity. This is the definition of an action-packed drama, much the same as The Hurt Locker was. It’s a movie that captures your attention from the very beginning and holds it there for most of the way through. 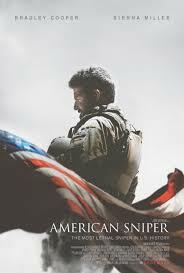 And just like The Hurt Locker, (which is the best of these types of films), American Sniper wants to put us in the shoes of the main character, both on and off the battle field. That means it brings him home to the states, a number of times, to show us how much the job has taken a toll on the way he functions around others. It’s all a sort of psychological study pumped up by tons of action scenes. The movie opens with a rooftop scene, where Chris Kyle (Bradley Cooper) is lying down on his stomach, deciding whether or not to take a shot. There’s an older woman walking outside with a kid, and the U.S. military convoy is directly ahead of them. It’s an area where no civilians are supposed to be, and it is the job of Kyle to keep the convoy safe at all costs. That means if he thinks this woman and kid are a threat, he needs to shoot them before they have the chance to do something. Only Kyle is unsure, and we see him struggling with making that decision, getting no help from the guy next to him or the people he is speaking with over his radio. The scene cuts away, before we get a conclusion and an answer to what Kyle decided, and instead it takes us into flashback mode. Here we meet Kyle and his younger brother, hanging out in Texas, trying to pick up girls. There’s a scene where a woman walks out on them saying they’d rather spend time around each other than with her, and the two guys just laugh it off. They go to a bar and we stay with Kyle as he flirts with Taya (Sienna Miller,) and ends up playing a drinking game with her. This game doesn’t end so well, and it turns into him outside, holding her hair back for her while she pukes. Back to the sniper scene that started the movie, we now see the way it all works out. Kyle sees that hesitating will get him nowhere in this situation as both the woman and the boy have bad intentions. He sees the woman hand the boy a bomb and then shoots them one at a time as they each pick it up and head toward the convoy. Now we are into the movie and ready to meet some of the characters Kyle surrounds himself with. Unfortunately this movie doesn’t do a very good job of presenting us with them. The Hurt Locker worked for a lot of reasons, but one of them was that it was about three main characters, and not just one. This movie is more like Zero Dark Thirty in that regard, focussing on one specialist, who even gets nicknamed “Legend,” because of how many people he has killed and how many American soldiers he has saved. This is Kyle’s first tour, that we are now on with him, and he already seems like a real leader with experience. Kyle goes down on the ground to lead men into searching abandoned homes, making sure nobody is living there. When they find a man and his family, they interrogate him and learn of a guy in the area named The Butcher. This is a horrid terrorist who kills his own men if they talk. It isn’t long before The Butcher shows up and comes after this man and his family. That’s a pretty scary scene with The Butcher holding a drill on the boy while his father watches. Kyle is there seeing it too, only he is stuck behind a wall, unable to stand up and take a shot. That’s because there is an enemy sniper who has Kyle in his sights. Every time Kyle tries to stand up, bullets whiz right over his head. This leads to The Butcher getting away. If the first tour was about meeting The Butcher, then Kyle’s second tour is all about killing him. The actual scene where Kyle gets his man isn’t nearly as exciting or clear as it should have been, with a simple car explosion. Even still, the movie doesn’t take long before announcing the next target, a man named Mustafa, who is a sort of legend among his men. This guy competed in the olympics for rifle shooting and won a gold metal. The third tour is when we actually encounter Mustafa. This time it’s Mustafa’s attack on the American soldiers. He shoots one of Kyle’s friends in the face pretty badly, right after the guy just finished talking about the ring he got to propose to his girlfriend. The fourth tour after this is the one where Kyle goes after Mustafa in a way that is as much about vengeance for his friend as it is about putting down this enemy legend just for the credit. In between all of these tours, we get about one or two scenes at a time with Kyle’s wife. They have a child together, only Kyle is more into his job as a sniper than he is about his family. At one point he comes back to the states and goes to a bar to get a drink by himself before even calling his wife to let her know he’s back home. There’s also a barbeque scene where he ends up attacking a dog. All of this is pretty interesting stuff. The movie has lots of action, but it isn’t always that great. I like how we get to know the targets, and how each tour is about something, whether it is the enemy attacking them, or them attacking the enemy. Still, with a lack of other characters, besides Kyle, and action that is only sometimes good, the movie ends up being entertaining, but not much more.